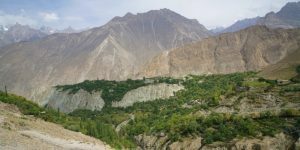 Hunza Valley (Hunza) is considered the most beautiful mountainous valley in Gilgit-Baltistan region bordering the Wakhan Corridor of Afghanistan and the Xinjiang region in China. Formerly a princely state for more than 900 years, it was dissolved in 1974 by Ali Bhutto. 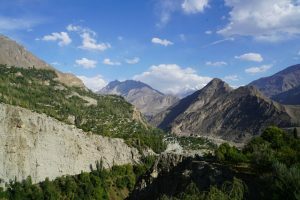 Baltit (also known as Karimbabad) was the state capital. 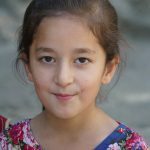 Historic Hunza hosts four genealogically diverse clans that trace their patrilineal ancestry to varying ethnic groups. 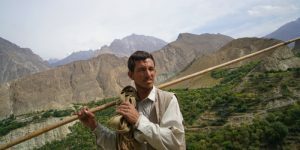 The Khurukutz are said to be related to the communities now settled in the Gojal-Pamir border region. 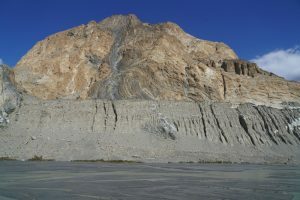 The Buroong people are said to be migrated up from the Indus region. Diramiting and Barataling trace their roots to the Balkans / East European ethnic diaspora. 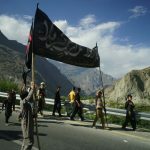 Most of the Hunza people are Shia Muslims of the Nazari Ismalia tradition. They are proud of their ethnic traditions and known for their longevity. The literacy rate of the people is believed to be more than 90%. 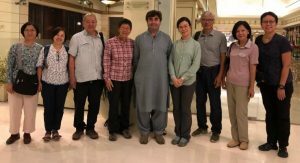 While we had a packed programme or long hours of driving from Day 1 to 8, we had a leisure time for the rest of the journey from Gilgit to the China-Pakistan border along KKH. 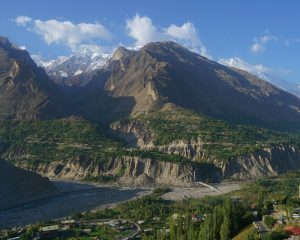 I got up at 8 am and had breakfast in the restaurant on the top floor which offers full views of the snow-cladded Rakaposhi Peak (7,788m) and the Gilgit town below. 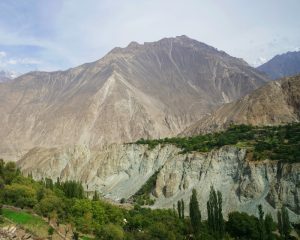 We set off leisurely at 10 am and visited the old bazaar of Gilgit which was once a bustling commercial town along the Silk Road. We stopped at the oldest and most famous herbal shop. We took many photos and the locals did not mind. But ladies normally would not want to be photographed. 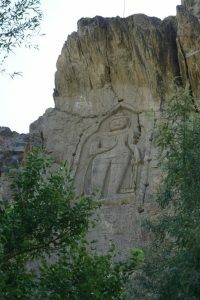 Our second stop was the Kargah Standing Buddha located on a cliff off the main road. We had to take a narrow road through a village. After getting off the minibus, we had to walk 20 minutes uphill. Though we already had full views of the Buddha from the road, I enjoyed the short hike to get as close to the Buddha as possible. A group of beautiful kids approached us. A pretty girl was a good model. I wonder whether she will act in the same way when she grows up. Our third stop to the Danyore Bridge, a suspension bridge built by Ahmed Ali (generally known as Breno), a self-taught engineer from Hunza. On the way, we had to stop for ten minutes to let some 30 military vehicles each with an armed solider with rifle AK 47 pass. What were they doing and where they going? It was a hot day. We walked about two kilometres crossing the bridge and through the town Danyore before having lunch. Joy was not feeling well and vomited several times. She looked pale and tired. After lunch, we set off after 2 pm. It was still very hot. We were back on the KKH. Just before leaving Minapin Nagar, I spotted a road-side indicating the location where the continental plates had collided. 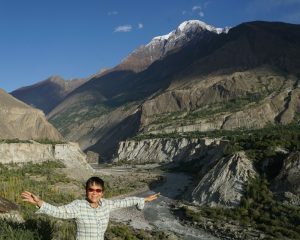 After Gilgit, we entered the Hunza Valley which runs along the Hunza River and KKH. The landscape and scenery along the river are magnificent with soaring mountain ranges with leafy villages surrounded by cultivated fields and fruit trees, scattering along the river banks. We also had a stop to look at the old Silk Road on the right side of the river. 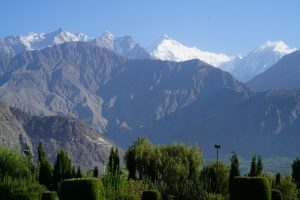 The Rakaposhi Peak which towers over Hunza, began to come into full view. We were glad to have a cup of tea at the viewpoint. At the end, we spent more than half an hour enjoying the magnificent mountain view. It was 4 pm and Saaz urged us to move on. Otherwise we would miss sunset. 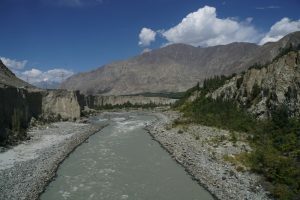 On the way, we arrived at the confluence of the Hunza River and Ghai River. It was a long and winding road to the Eagle’s Nest Hotel locate at Duiker. Before checking, we walked to the hill top by the hotel (about 2700m). It was almost 6 pm and we were 10-20 minutes late. 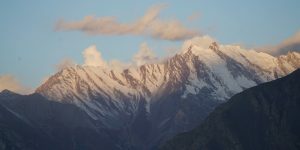 Owing to the high altitude and height of the mountain ranges, we did not see sunset with deep hues. 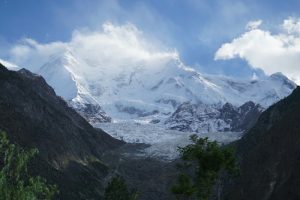 Anyway, we had awesome 360° view of surrounding mountain ranges with dozens of peaks over 6,000m including the Rakaposhi Peak, Deran Peak (7,327m), Golden / Spantik Peak (7,027m), Ultar Peak (7,388m) and Ladyfinger Peak (6,000m) and many glaciers. The view of the valley below is also stunning. 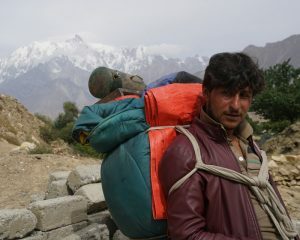 We all had rooms facing the Rakaposhi mountain range. After an early dinner, we all went to bed early as we had to get up around 4 am to watch sunrise. I got up at 4:15 am and left with Flora, Joy, Kylie, Ophelia and Sunny for sunrise. It is a short walk and we got to the top around 5 am. We later discovered that owing to the height of the surrounding mountain ranges, it was impossible to watch sunrise. The sky was soon lit up. 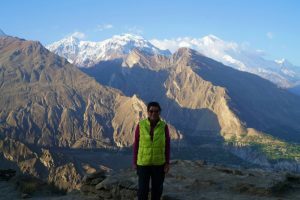 After 5:30 am, I watched the first ray falling upon the Rakaposhi Peak and later the Golden Peak in front of me and then the Lady’s Finger behind me. The hill top is fairly flat. I had a leisure stroll for an hour looking at a few ruins and gazing at the stunning surrounding mountains haze and the river valley blurred with morning mist. The scenery is lovely but not as spectacular as I had thought. I walked back to the hotel to sleep before 7 am and did not get up till 8:30 am. 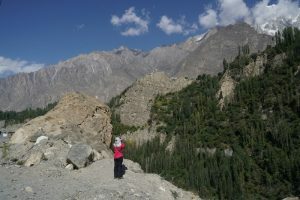 We had to pack and spend two nights in Embassy Hotel in Karimabad (elevation: 2,378m) which is not far from Duiker. 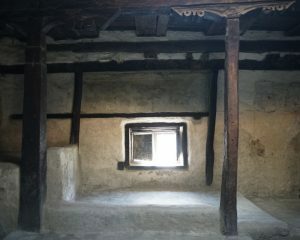 Today, we would visit two forts in the area. 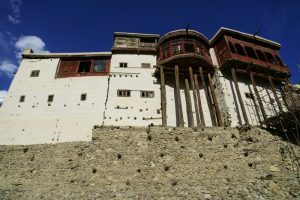 In the morning, we went to the Altit Fort built over 900 years ago as the home of the Mir, the hereditary rulers of the Hunza state. We had to walk through one of the oldest settlements (the other two are Ganish and Balti). The village with a large rectangular water tank surrounded by trees and locals sitting and chatting under the trees is exquisite and other-worldly. The locals are beautiful: they look Caucasian with fair skin, high cheek bones, blue and green eyes. 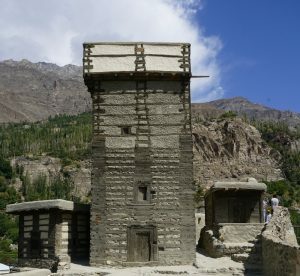 The Shikari Tower is around 1100 years old which is the oldest monument in the Gilgit-Baltistan. in fort is surrounding by a beautiful and leafy garden. 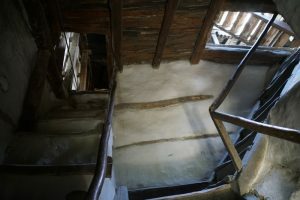 The interior looks sparse and rustic. But the views from the fort are break-taking. We finished the tour and spent almost two hours waiting for lunch at the Kha Basi Restaurant. We chatted and ate local dried apricots, nuts and mulberries brought by Saaz. Food finally arrived: it was worth waiting. We had for the first time burus sapik (pizza), geeyaling (pancake), dawdood (yak meat), hooyologarma (spinach +pasta) and chapshoro (pizza with meat) and deramfity (sweet). These are local dishes are healthy and tasty. As a result, I had overeaten! After lunch, we drove to the Baltit Fort in Ganish. Built two hundred years later than the Altit Fort, the fort is located just below a glacier with commanding views over the valley. We had a good guide who speaks English well. 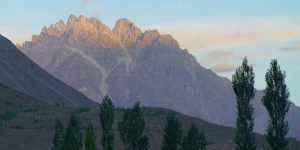 I began to better understand the history of both Ismali Muslim and the King of Hunza. We checked in the Embassy Hotel after 6 pm and had an early dinner at 7 pm. Karen probably affected by altitude sickness did not feel well. Brenda whose bites turned nasty was troubling her and she did not feel well. I did not have a good appetite as I had eaten too much at lunch. I was very tired and went to bed around 10 pm. An early night is good for the body. Today, we would be going to Brenda was worried about the bites and her skin problem. 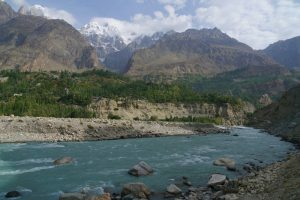 Saaz would take care of her while Karim would take us to the Hopar Valley with three glaciers namely the Hopar, Barpu and Mier Glaciers. We set off after 9 am. 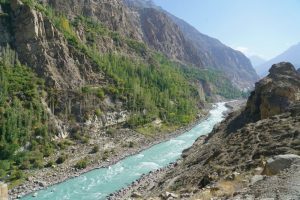 Soon we crossed the Hunza River and followed the Nagar River till we began to climb the steep slope on the right-hand side of the valley. The road is winding and narrow. 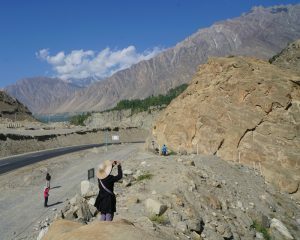 We had a scenic drive with amazing views ofthe glacier valley and many villages. It was about 10:30 am when we arrived at the village at the end of the valley with about 2,000 inhabitants. 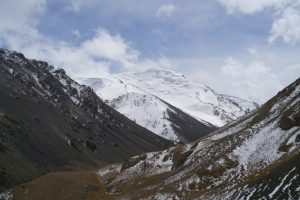 Karim took us to a viewpoint to see Hopar Glacier. Flora who had not been feeling well possibly owing to the winding road, vomited. She had to take a rest.. I spotted another viewpoint about 100m higher up and closer to the glacier. I proposed to hike up and others followed. We had superb views of the glacier and the valley. We met a group of Japanese hikers who spent 6 days on a hiking trail to Rush Lake Hoper (elevation: about 4,700m). I love to take this hike one day if I remain fit! We followed the same road out and went to Aliabad for lunch. 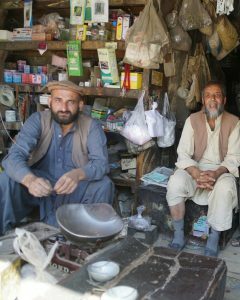 Saaz’s family is from this village and his father still runs a store there. We had yak soup and yak meat for the first time on this trip. 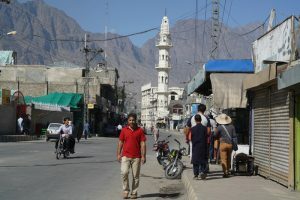 In the afternoon, we spent two hours shopping in Karimabad. I bought several kilos of dried fruits which are grown in the valley. I also bought six bottles of apricot and walnut oil which is good for the skin. Saaz had invited us to have dinner with his family. 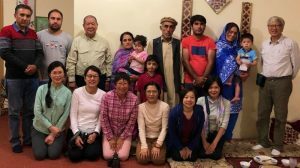 We were warmly greeted by his father, wife and son Sajeel, sister-in-law and her two children and his cousin who speaks fluent Chinese. The family has a comfortable and expansive 3-storeyed house with a large orchid. It was the first time we visited a local family on this trip. We sat on the floor with Saaz’s father, Karim and his cousin. Our host Saaz and the ladies were busy serving us: it is their custom. But we felt uncomfortable as we preferred our host to sit and enjoy the meal with us. I did not eat as much as I loved to as I could not sit comfortably one the floor and eat at the same time. We had similar dishes as we had in the Altit Fort restaurant. We tasted local chicken which was tender and delicious. We had a great evening and left at 8:30 pm. Saaz and family would have their dinner after we left. 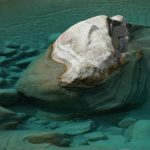 We set off at 9 am with Karim to see the famous Hunza Rock Painting by the main KKH between Ganish village and Attabad Lake. 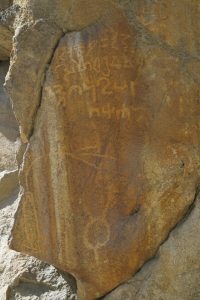 The carvings on the rock date back to the 1st millennium AD. There are four groups spreading over about 200m along the highway. It’s not easy to follow and listen to Karim. As a result, I missed out on most of his explanations. 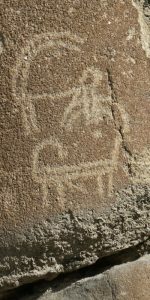 But from the information boards, I understand the inscriptions had been carved in Sogdian, Kharosthi, Brahmi, Sarada, Proto and Tibetan languages. 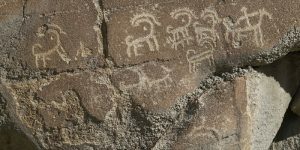 I saw many images of animals including ibexes that holds cultural importance in ancient times. While we were looking at the paintings, Saaz took Brenda to the clinic in Aliabad to dress her wound. They caught up soon and Karim took her on a private tour. I followed and picked up some information about the paintings and inscriptions. Kylie and I moved to Saaz’s 4WD. It is a great way to travel in a mountainous region. 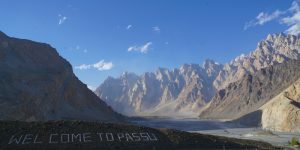 We now reached Upper Hunza known for sweeping landscapes and vistas of the 7,478m tall Passu Sar mountain, the Passu Glacier and Passu Cones with brilliant crests in pyramidical shape at 6,106m. 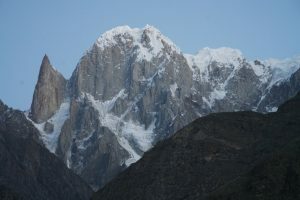 High peaks nearby include Passu Sar, Shispare Sar and Batura. 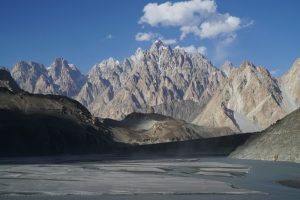 The Passu Cones is the most photographed peak of the region. 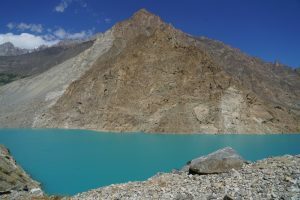 Our second stop was at the Attabad Lake (also known as Gojal Lake) which was created in January 2010 by a landslide dam. 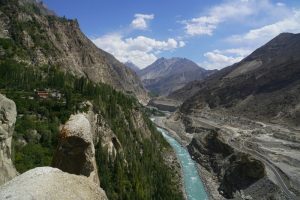 The landslide killed 20 people, blocked the flow of the Hunza River for five months. The lake flooding has displaced 6,000 people from upstream villages, stranded a further 25,000 and inundated over 19 km of KKH. 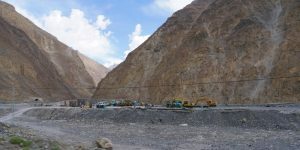 As a result, 24km patch of KKH had to be realigned containing five tunnels at Attabad Barrier Lake. Measuring 21km long and 100 m deep, the lake has become a tourist attraction owing to its unique blue colour and dramatic mountain backdrop. It was a sunny and warm day. We had an enjoyable tea break. 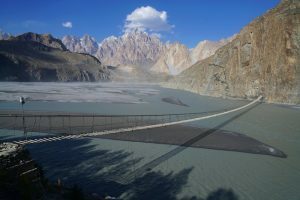 Suspension Bridge over Hunza River with Passu Cones as background. 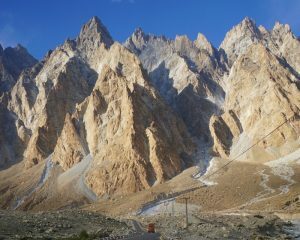 We stopped for lunch in a hotel which affords our first views of the famous Passu Cones (also known as Cathedral Ridge). 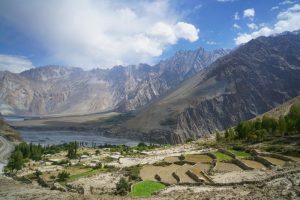 The valley here is narrow without extensive farming. 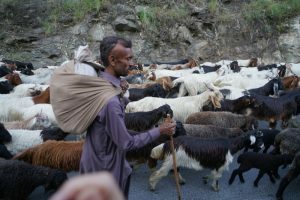 After passing Gulmit, we stopped at the Gulkin Village. 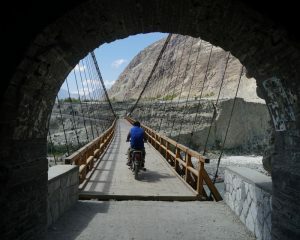 Here we had an hour free time and one could walk across a hanging bridge over the Hunza River. The bridge looks a bit scary: one might be blown off by strong wind swiping through the valley. I took up the challenge and reached the other side without problem. 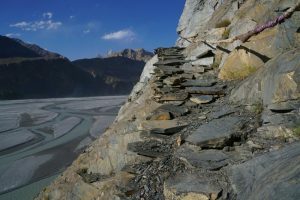 There is a staircase built with rocks next to the bridge. I was curious to look at the landscape round the bend of the river. Hence, I climbed 70-80 m to reach the end of the staircase. The path goes further to the bottom of a glacier. It was very windy: I worried I would be blown off the cliff. I therefore sat down and moved on my bump on one occasion. 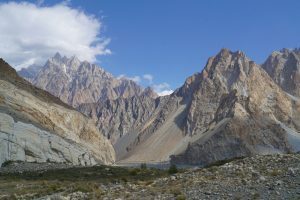 Once we left the Gulkin Village, we drove with the stunning Passu Cones forming a barrier in front of us. They are awesome and imposing! 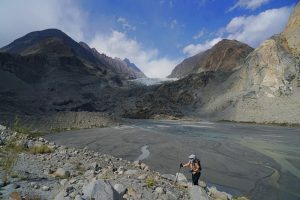 We had a quick stop at the Batura Glacier which is 57km-long, the seventh longest glaciers outside the polar regions. Around 5 pm, we arrived at the Sarai Silk Route Lodge. I felt I was trapped by a vertical rocky cliff in front of me and high mountains with glaciers around me. We met a family in the lodge that had spent a few days in the Borith Lake (elevation: 2,600m) not far from the lodge. They highly recommended a visit. (We therefore asked Saaz and Karim the next day to take us before departing for Sost). It is our tradition to “chase the moon” the night before the Moon Festival. Tonight, we followed our tradition and had moon cakes. But as we were enclosed by soaring peaks, we could only see the moon when it was directly above us. 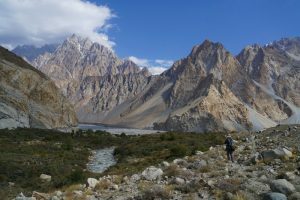 Karim took us on a gentle 2-hour hike to see the Passu Sar Glacier behind the lodge. An easy walk with great views! 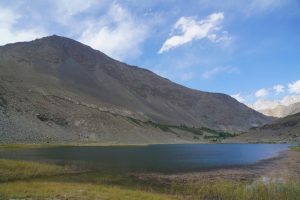 Then we drove a short distance to the Borith Lake which is 2-3 km off the KKH. It is a sanctuary of migrating wildfowl with a small hamlet and a couple of guesthouses at the southwestern end of the lake. Though small, it offers great views of the Ghulkin and Passau Sar Glaciers. We had a wonderful and leisure walk round the lake (less than 3 km). looking at birds, waterfowls, amazing art-like rocks formed by wind erosion. 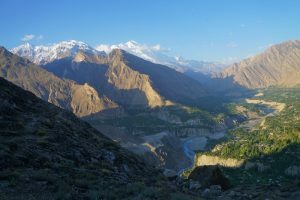 The landscape with two glaciers and high mountains is stunning. 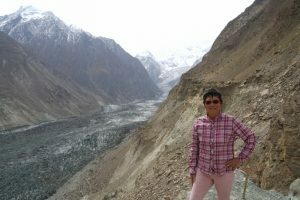 I discover that Iman, owner of Snow Leopard who planned our trip in Tajikistan, was born here. At the end of the walk, we walked past a house with ripe apricots on the trees. The lady kindly gave us a dozen which were sweet and most delicious. We had a lovely lunch in the guesthouse run by Iman’s cousin. We checked out the rooms of the hotel which look very comfortable with full views of the lake and mountain ranges. If I return to this area again, I love to spend a couple of days here. We did not leave till 3 pm. We arrived at Sost (2,800m), the last town inside Pakistan on the KKH before the Chinese border. and arrived at the Embassy Hotel (about 3,000m) in Sost after 5 pm. Karim gave us a nice parting gift: he invited us to his house for dinner! We had our second home visit and fantastic home-made food which we had in Saaz’s house. Karim has four sons. 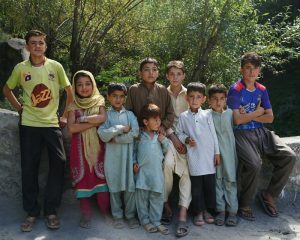 His two elder sons have left home to study in college while the two youngest sons (14 and 4) are still at home. We were impressed by his third son who is a brilliant top student at school and a lovely son helping his mom in preparing food for us and his father in serving us. Karim’s wife is more traditional and does not wish to meet strangers. It’s a pity that we did not have a chance to thank her in person for her hospitality and excellent cooking. 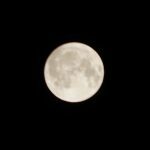 Tonight, we could finally see a full and bright moon befitting for the Moon Festival. We spent over an hour outdoor to enjoy and take photos of the moon. We set off at 8:30 am and spent an hour at the immigration office in Sost. As expected, security is tight. But the problem is inefficiency. We spent an hour lining up to get our passport stamped. At 10 am, we were ready to go and said good-bye to our dear friends Saaz and Karim. We took a private bus (US$580) which would take us to Tashkurgan, China. We drove through Khunjerab National Park. After driving for 45 minutes, we had to go through a check-point where we saw our first golden poplar tree. After a short drive, we had to go through a second check-point and produced our passport. 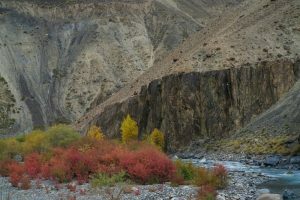 We continued to drive through a narrow gorge with soaring mountains on both sides. We saw dozens of ibexes on the slope and I spotted a red fox running across the minibus. 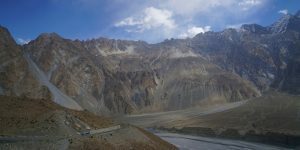 Our vehicle began to climb and around noon, we finally reached Khunjerab Pass at 4,655m which forms the border with China. Once we passed the border, we saw the Chinese flag and were on Chinese soil. Good-bye Pakistan! Pakistan is a pleasant surprise and I had an eye-opening trip. First, I am lucky and have great travel mates. I did not know WH, Sunny, Joy, Ophelia and Karen before the trip. They are easy going, lively and fun to travel. 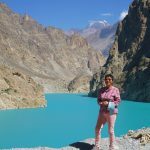 Brenda is a Tibetologist and we learnt a lot from her when travelling through SWAT Valley which is littered with Buddhist ruins. Second, Pakistan has long history and diverse cultures. It is particularly impressive to see archaeological sites from the time of the Persian Achaemenid, Alexander the Great and other Indo-Greek kingdoms. The Buddhist sites with ruins from the Maurya and Gupta empires are equally stunning. I have seen Buddhist Gandhara sculptures in India and other museums. The ones in Peshawar and SWAT Valley are remarkable. I can better appreciate the Greek influence after this trip. Third, I calculate our drive from Lahore to Khunjerab Pass is around 1300km with about 500km on the KKH i.e. 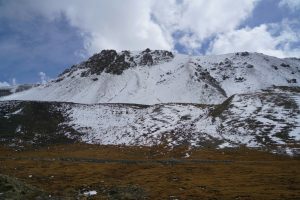 from Besham to the Khunjerab Pass. We might have covered over 1500km including the side-trips we had made. 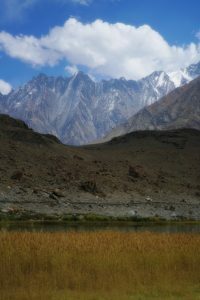 We have travelled along the Indus River and seen traces of the Silk Road. 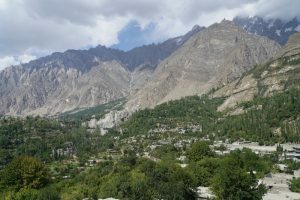 The mountainous Northern Pakistan and beautiful Hunza Valley are spectacular and most stunning and amazing. I have seen many mountain ranges in Asia, Africa, Europe and Americans and some of the world’s highest peaks. 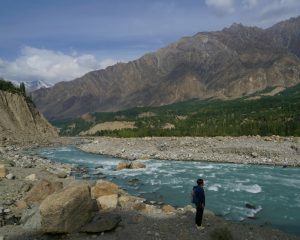 But I am still overwhelmed by the landscape and mountain ranges in Pakistan. 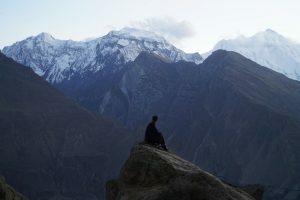 Fourth, Hunza Valley is a world on its own and a hidden gem. It is easy to recognise the origins of the people whose ancestors had come from Persia and Greece. They have beautiful features and are open and welcoming. I appreciate the importance the Ismalis attach to education. 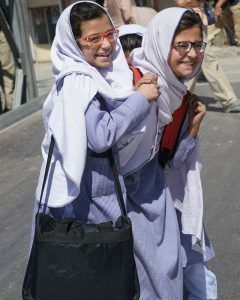 Their emphasis on giving good education to girls is uplifting. As a result, they are better educated and have higher standard of life. Fifth, I am surprised by Pakistan’s overall infrastructural development. I was travelling in India last November and have seen parts of Delhi, Mumbai, some poor states in the north as well as riches states in the south. We travelled on some terrible national highways and a 150km-long train journey to Mumbai could take five hours. In Pakistan, I guess I have covered some 1500 km in total. 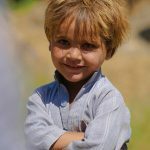 Apart from Peshawar and some parts of the SWAT Valley which have suffered terribly from the Taliban era, the country functions normally and looks relatively organised. I have not seen the extent of visible poverty and dilapidation as I have seen in Bihar and part of Mumbai. It is encouraging. Finally, we have been lucky to have Saaz from the Asian Gateways and Karim, our Indo-Greek guide to organise our trip. We are inquisitive and have asked lots of stupid questions. We are old, forgetful and slow. They have been patient and most accommodating. Cha Cha, our driver, is excellent. Though he is slim without muscles, he lifted our nine heavy suitcases twice every day without breaking his back. I have been to Karachi to visit Lawrence, my brother in the late 1980s. I did not think highly of the country after my first visit. But this 14-day trip is most educational. 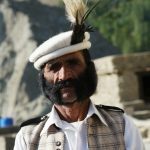 I have now seen a small part of Northern Pakistan which landscape and scenery are incredibly awesome with beautiful people and diverse cultures. 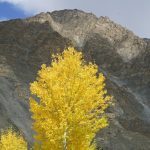 I would certainly return one day in the fall to enjoy the rich foliage colours, to take a short hike and get a glimpse of K2 and to explore other parts of the amazing mountainous north. I just hope the country will thrive, keep the extremists and terrorists at bay and continue to progress.